Ubuntu Gutsy 7.10 will officially be released next month. A countdown clock for Gutsy day has been shown on VnTutor blog today. 10 new events are listed out to welcome Ubuntu Gutsy Gibbon. It can be downloaded from various official Open Office mirror sites. You can download it right now from this mirror. 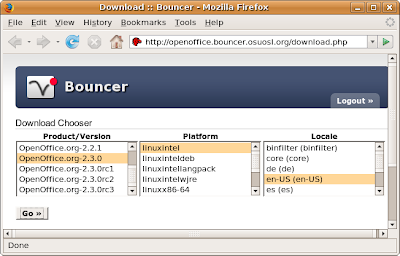 Then, you select “OpenOffice.org-2.3.0″ as the distribution, your platform and language. The following picture is my case. Click on "Go" button to start downloading (136.6 MB). The new release contains hundreds of bugfixes and enhancements. You can read more notes here to know what is new in this version. Try it while it's hot.